We appreciate everyone's patronage of the Downtown Franklin businesses during the Roadway and Streetscape Improvement Project. When finished later this summer, downtown Franklin will be beautiful! Here's an overview of the project milestones. More detailed information can be found on the Town of Franklin's website, http://franklinma.virtualtownhall.net/Pages/FranklinMA_Planning/dtimprovement. 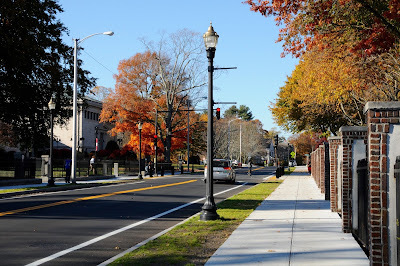 Completed section of Main Street near Dean College. Period light poles are part of the overall improved appearance. Even though construction began in April 2015, the Town of Franklin’s Roadway and Streetscape Improvement Project has been in the works for nearly 15 years. Ultimately the Streetscape Project will improve traffic circulation and road conditions, improve emergency response times, and improve pedestrian safety while enhancing the downtown’s overall appearance and promoting private sector investment. Throughout the process, the Franklin Downtown Partnership worked to ensure downtown business owners’ and residents’ opinions about design issues affecting downtown were represented. The FDP currently is helping spread the word about the project’s progress. 2001 – The Town of Franklin began working with the MassDOT and engineers on roadway improvement plans. 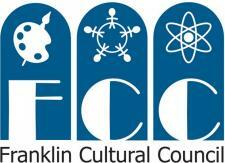 The Franklin Downtown Partnership was created to help revitalize the downtown area and promote economic growth. 2006 – The late Senator Edward M. Kennedy presented a $5 million federal grant check to the Town of Franklin to help fund the Roadway and Streetscape Improvement Project. 2008-2010 – The Town and engineers conducted several transit and parking studies, and improvement project plans were reviewed and discussed in a series of public meetings. 2012 – Draft plans for the project were completed, and a 25% Design Public Hearing was held. 2013 – The Town obtained easements required for the project, MassDOT approved the plans, the State released funds for the project, and the process of vetting contractors and awarding contracts began. 2015 – Construction began in April. 2016 – Project due to be completed in August. More information about the Roadway and Streetscape Improvement Project can be found on the Town of Franklin’s Department of Planning & Community Development webpage, http://franklinma.virtualtownhall.net/Pages/FranklinMA_Planning/dtimprovement.